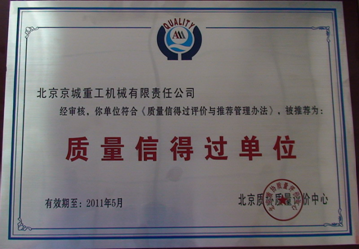 Beijing Jingcheng Heavy Industry is awarded “Quality Reliable Enterprise” by Beijing Quality Evaluation Centre. JCHI always regards quality management as the core of enterprise management. The company sets concrete quality objectives every year and makes strict assessment for products’ quality. Since last July, JCHI has been conducting a year-round "Zero Defect" activity. The company has been carrying out a series of reforms in terms of products’ quality, work quality and customer satisfaction. 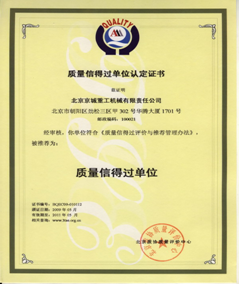 The title of “Quality Reliable Enterprise” would further improve the well-know of JCHI and the company’s market share. JCHI will adhere to the fine management and ensure the quality and safety of its products.